There’s one spot in my house that ALWAYS gets stained: the kitchen sink. It could be the chai teas and coffee. Or the cocoa powder I use for homemade hot cocoa. In any case, my white kitchen sink is rarely ever really white. Enter soft scrub cleaners. I refuse to resort to bleach or other toxic, chemical soft scrubs. But then I found out an easy-to-make soft scrub cleaner. It’s made with just two ingredients: baking soda and Lemon essential oil (how to order). The stains just lifted right out and my sink looks nearly new. The kitchen sink isn’t the only place I use this DIY Homemade Soft Scrub Cleaner. I also use it on counter tops, stove tops (yep, it’s great for that grease grime), ovens, tile, grout, bathroom tubs, shower stalls, toilets, and so much more. Baking soda is a fantastic base for this recipe. It’s a gentle, natural abrasive that will lift dirt and grime without scratching. It’s used in most commercial soft scrub cleaners – which also have a long list of harsh chemical cleaners too. Baking soda and water alone work well as a DIY soft scrub, but the secret ingredient is lemon essential oil. Yep, you read that right. Lemon essential oil is like a natural goo and gunk cleaner. 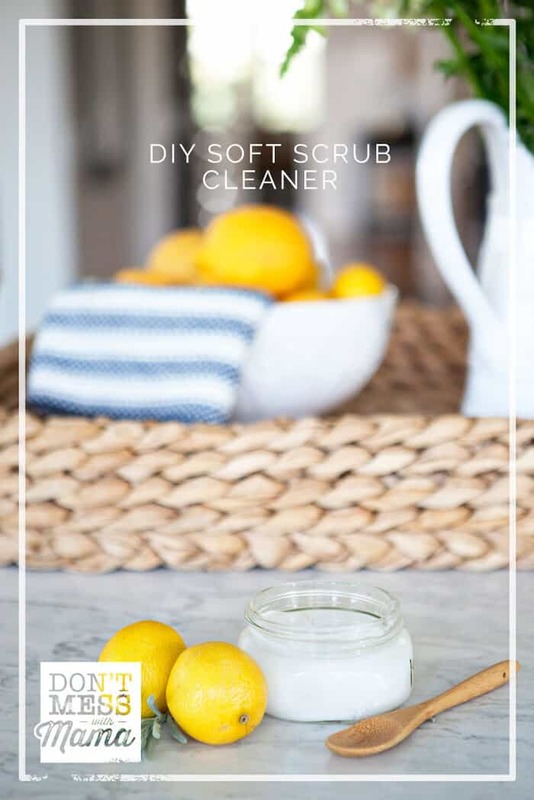 It helps to lift stains like nothing else and combined with baking soda, it makes an amazing (and cheap) DIY Homemade Soft Scrub Cleaner that’s great for almost any cleaning job. Mix baking soda with water in a small bowl to make a thick paste. You may need to add more baking soda or water to adjust theconsistency to a paste. Add lemon essential oil and mix well. Apply paste directly to stained area and scrub until stains are gone. Do you need to use a glass bottle when using the thieves household cleaner? I would highly suggest it and move away from plastic. You could get a stainless steel bottle as an alternative. So glad the recipes are helpful to you.